Paul Kraft, left, president of the Pima County Real Estate Council, with Pima County Administrator Huckelberry, center, and Tucson Assistant City Manager Albert Elias. Nothing like a great recession, tight municipal budgets and a little wake-up call to drive home the point that “real estate matters” in this community. It is crucial to act now so that there is hope to have “a more competitive foundation” in place for the future. Specifically, that “foundation” is a corridor of opportunity south of Tucson International Airport between interstates 19 and 10. The western sector is anchored by 11,000 jobs at Raytheon Missile Systems and the eastern sector by about 8,000 jobs at the University of Arizona Science and Tech Park. “Some 40,000 jobs are tied to this corridor, some type of manufacturing, technology and research that drives basic secondary and service employment. How do we make sure this employment corridor is important now and in the future?” said Huckelberry. For starters, county officials realized they had to take care of Raytheon, the region’s largest employer. The company’s 2010 decision to set up a new line in Alabama instead of locally cost Pima County about 3,000 to 4,000 jobs, Huckelberry said. “It was a wake-up call that we were vulnerable to having that employment base shrink or go away. So we began some long-range fundamental discussions with Raytheon,” he said. Tucson was “never in the ball game” for the expansion because the site has too many constraints. Urban encroachment from the south and increased traffic on Hughes Access Road threatened Raytheon’s safety buffers and other federal mandates for space. South of the site, the county bought $5.9 million worth of “developable” property. Also, $9 million in funding has been secured to relocate Hughes Access Road further south. When these two major projects are complete, in addition to some other county-driven improvements, “our largest employer will no longer have constraints that would restrict them from expanding their operations in Tucson,” Huckelberry said. 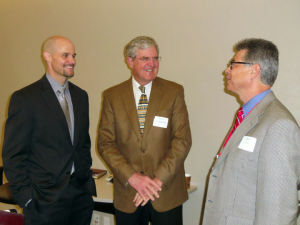 Huckelberry and Tucson Assistant City Manager Albert Elis were keynote speakers at the Feb. 7 Pima County Real Estate Research Council’s “Real Estate Matters” forum. Elias said the city also has begun to focus more on economic development. Specifically, he cited a series of initiatives that helped developers Rob Caylor and Art Wadlund decide to build a $16 million Class A mixed-use office tower downtown at 1 E. Broadway. In addition, the city hired Juan Francisco Padrés to serve as an economic specialist for international trade. E-mail sales and leases and other real estate news items to [email protected]. Inside Real Estate & Construction appears weekly.